Crowned: 6 January 1066 at Westminster Abbey. Ruled: 5 January-14 October 1066. Edward the Confessors brother in law. Married: (1) c 1045, Edith Swanneshals (Swan-neck): 6 children; (2) c IO66, Edith (Eadgyth) (b. c 1042), dau. Alfgar, earl of Mercia, and widow of Gruffydd ap Llywelyn of Wales: I child. Died: (In battle): 14 October 1066, aged 44. Buried: Battle, Sussex; remains later removed to Waltham Abbey, Essex. Harold is romantically portrayed as "the last of the Saxons" in the novel of that title by Lord Lytton. In some ways his heroic death at the battle of Hastings was a last ditch stand defending the old order against tyrannical oppression. On the other hand Harold was not the lily-white champion of virtue; he was a violent man with a vicious temper. He was the son of Godwin, earl of Wessex, and inherited his father's title in 1053, having previously been earl of East Anglia. He was exiled from England along with his father and brothers in 1051 when Edward the Confessor quarrelled with Godwin and used that as an opportunity to rid himself of someone who was becoming too powerful. Godwin and Harold nevertheless invaded England the following year. Had the family not been so popular and powerful and held in such high esteem by the English, any other king might have tried them for treason (Godwin was probably responsible for the death of Edward's elder brother Alfred, let alone this bold affront to the English crown). Edward, however, forgave Godwin (albeit unwillingly) and restored him and his sons to their earldoms. After Godwin's death, Harold, who was the eldest son, became the senior earl, and increasingly took over the administration and government of England, whilst Edward involved himself more in church affairs. 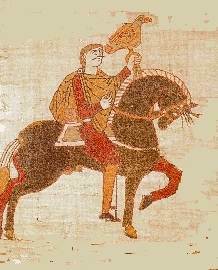 By 1064 Harold was designated "Duke of the English", tantamount to heir apparent. Harold had almost certainly instigated the mysterious death of Edward the Exile, the real heir to the throne who had returned to England in 1057. Harold maintained a vicious campaign against the Welsh prince Gruffydd Ap Llywellyn, whom he forced into submission first in 1057 and again in 1063, the latter campaign resulting in Gruffydd's death. Harold later married Gruffydd's widow, Edith, the daughter of the earl of Mercia, though Harold already had a wife, married according to the Danish law, also called Edith (known as Swan-neck), whom he truly loved and who bore him six children. Sometime in 1065 Harold was at sea in the English Channel when his ship was blown off course and he was driven on to the coast of Normandy. This has always been a curious episode, never fully explained. Harold purportedly agreed that Duke William would be Edward's successor and paid homage to William. Knowing Harold's character this was unlikely, and could easily have been invented by William later, when no one could disprove it. Whatever the circumstance, by the end of 1065 William, who had previously been made heir by Edward the Confessor, though again somewhat secretly, firmly believed he would be the next king of England. In November 1065 Tostig, Harold's brother and earl of Northumbria, was ejected from his earldom because of his callous misuse of authority. Harold attempted to mediate, but Tostig was forced to flee the country. During the winter he planned his invasion of England. On the night of January 4/5, 1066, King Edward died and Harold was proclaimed and crowned king. William of Normandy regarded this as treachery and he too prepared to invade. The first to attempt it was Tostig with a fleet from Normandy. In May 1066 he harried the southern coast of England and round as far as Lindsey in the east, where he was defeated and fled to Scotland. He appealed to his cousin Swein in Denmark who was prepared to offer him an earldom, but not support for an invasion, so Tostig made his way to the court of Harald Haadraada, the king of Norway, and the most fearsome Viking of them all. Harald was initially unsure, knowing the strong defences of England, but Tostig convinced him and through the summer the Norwegians prepared their fleet whilst William of Normandy prepared his. Harold used the period to strengthen England's coastal defences. In September Harald Haadraada sailed with a mighty fleet of some two hundred warships, stopping first at Orkney where he gathered more supplies and men. He sailed with the earls Paul and Erlend down the coast to the mouth of the Tyne where Tostig waited with a further force of men from Scotland and Man. This massive force continued down the coast of Northumbria, pillaging and destroying as it went. It was met at Fulford on 20 September by an English army under earls Morcar and Edwin which was defeated. York agreed to surrender and the invaders withdrew to Stamford Bridge to await negotiators. There, on 25 September, they were surprised by the army of Harold Godwinsson which had undertaken a forced march north. The battle that followed was a total victory for Harold. Both the Norwegian king and Tostig were killed. But Harold had no time to relish his success. Two days later the wind that had stopped William sailing changed and his invasion began. Harold was forced to march south again at full speed, and the two armies met at Senlac Hill, north of Hastings on 14 October. With hindsight Harold should have waited. To engage two major invasion forces at either end of the kingdom within one month required superhuman ability. The astonishing thing is that Harold almost won. The Normans' technical sophistication was of limited use against the Saxon shieldwall with which they protected the position. A retreat by the Breton forces encouraged a pursuit that exposed the English to a cavalry counter-attack, but the battle was decided by hard, attritional fighting. As dusk came on the lofted arrows were eroding the ranks of the Saxon axemen. Harold was not killed by an arrow in his eye, but he and his brothers died defending each other to the last. Had Harold been the victor, it is a fascinating exercise in alternative reality to consider what might have become of England. Two such great victories would have made Harold secure in his kingdom, seemingly invincible. He was not young, but there is no reason why he could not have reigned another twenty years or so. In that time, unless he changed his ways, the real Harold would have been revealed - the sly and devious son of Godwin. The Saxons might have continued to rule for another century. But such was not to be. All but one of Harold's sons lived into the 1080s and beyond, though we lose track of them before their deaths. Although the English initially rallied around the young atheling, Edgar, they soon capitulated to Duke William who ever after was known as William the Conqueror.